It looks like summer has arrived so it’s time to get down to the river again. 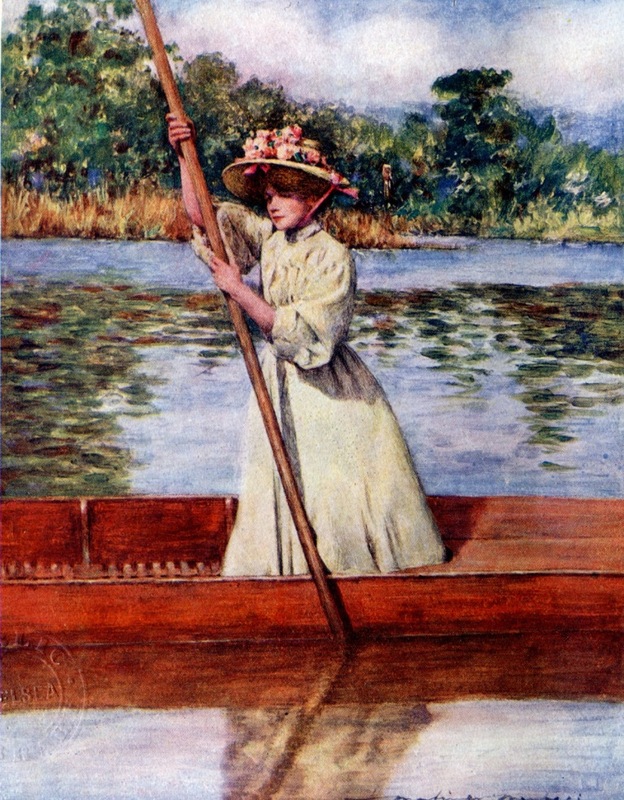 This week’s post is a long delayed companion to Menpes on the river, revisiting his paintings of that long Victorian summer of boating on the Thames but this time in photographs. Some of these images show the same locations that Menpes painted, others show yet more outposts of the quiet life along the river. I’ve walked as far as Kingston along the Thames Path. I remember this spot and although there were fewer boats when I saw it I can still recognize the place I visited. 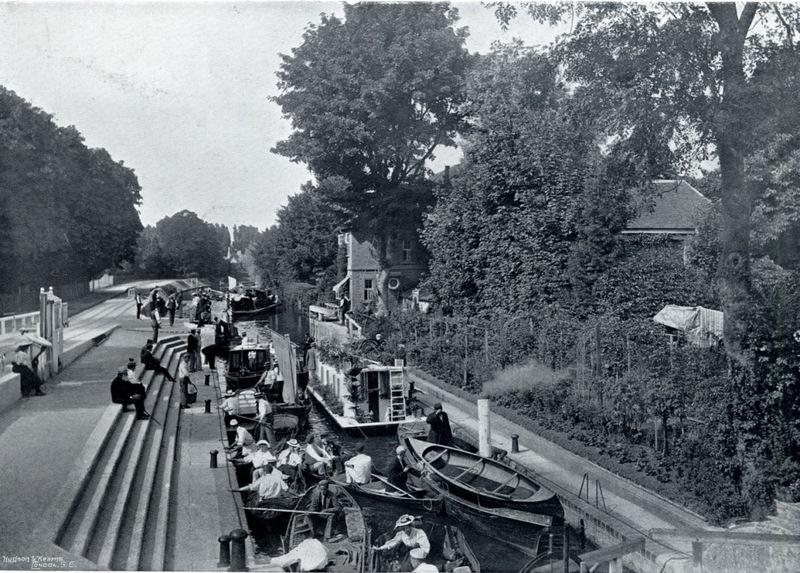 Teddington Lock, some of you may remember was the location of Thames Television’s studios in the 1970s. The river in Jerome’s time was becoming a pleasure resort for a wider range of people, not just the upper middle classes. 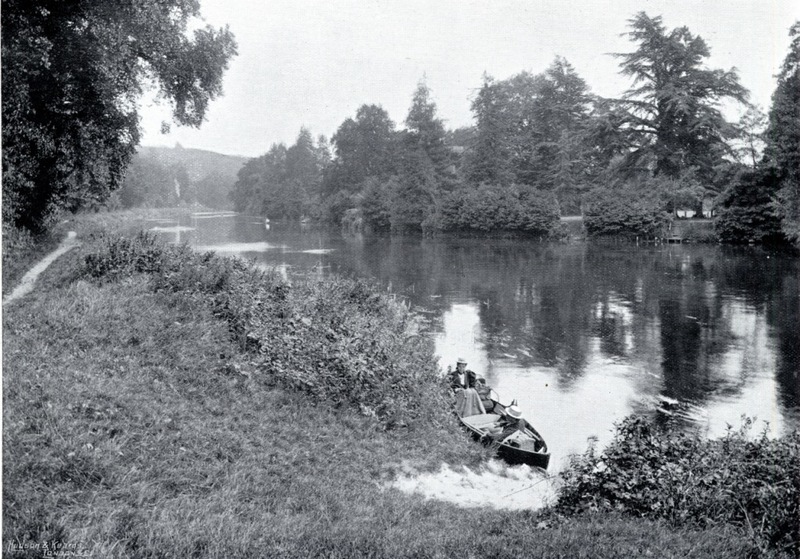 The white collar workers, men and women who spent their working days in the City could now afford to come down to the river in their leisure time. Although some no doubt enjoyed being in a mass of fellow pleasure seekers, the ideal of river pursuits is solitary. Across the river is the tower of St Michael’s Church at Bray where the famous Vicar of Bray officiated. I prefer to think of Bray as the home of Bray Studios where the Hammer company made horror films in the 1960s. 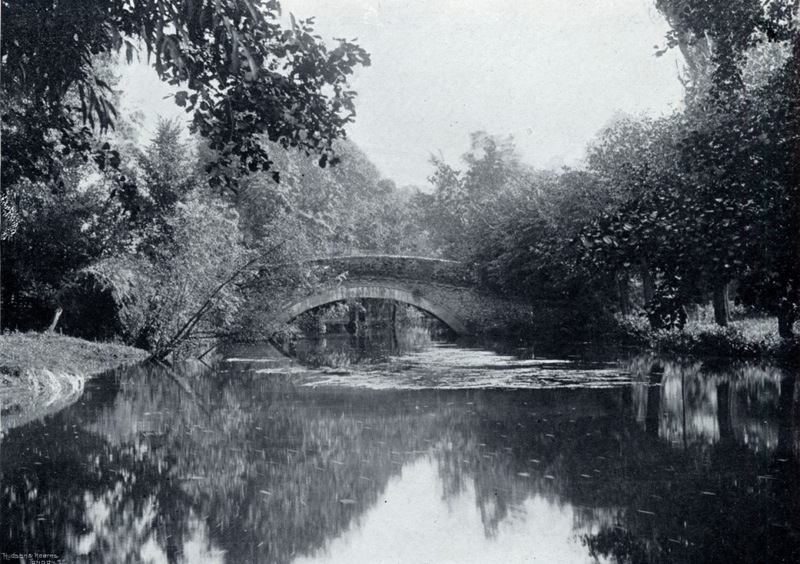 Boulter’s Lock is one of the places that Menpes painted. This view shows the approach to the lock. The picture below shows it as Menpes painted it in a crowded condition. Below, a much more exclusive group walks by the river in front of Spring Cottage on the Cliveden Estate. 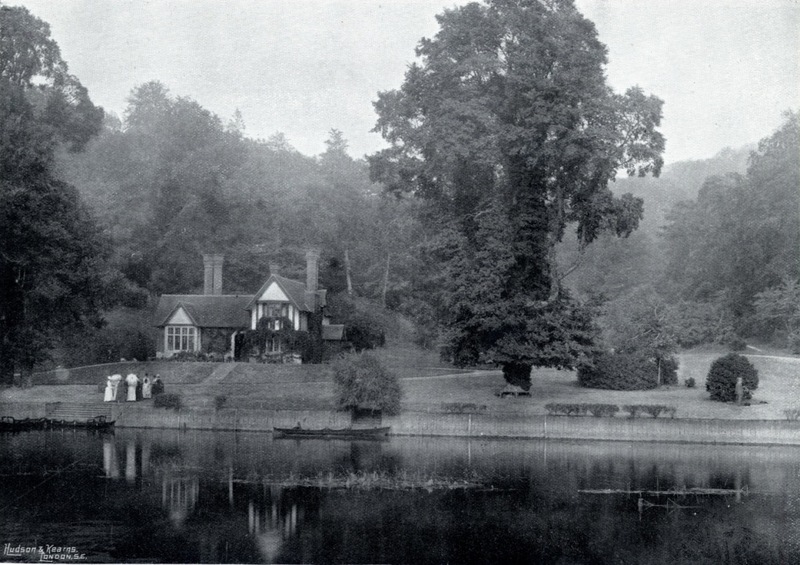 Much later Spring Cottage was leased by Stephen Ward and was one of the locations associated with the Profumo affair. Below. a boating couple are mooring in a secluded spot opposite Formosa Island, one of the many river islands, also called eyots or aits. These pictures have the tendency to make me want to write about long summer afternoons gliding quietly through a still landscape. I did some of that in the Menpes post. 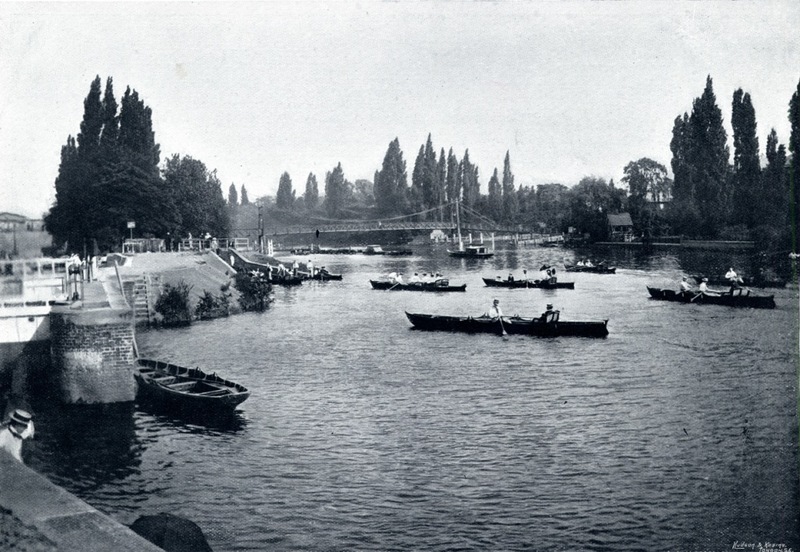 Riverscapes give me a sense of nostalgia, not only for my own teenage years when I did a bit of rowing on another quiet river, but also perhaps some of that nostalgia for an imagined past which I have also written about when discussing the Chelsea Pageant or the Whitelands May Queen. It’s a longing for an older, more idyllic England. 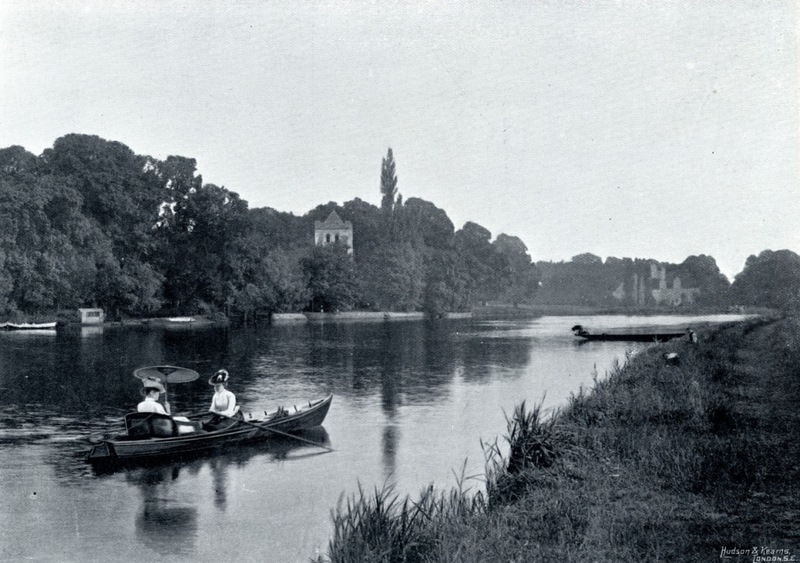 Below, At Bisham two women are boating. Boating was, like cycling one of the leisure pursuits which the “new women” were taking up in larger numbers. 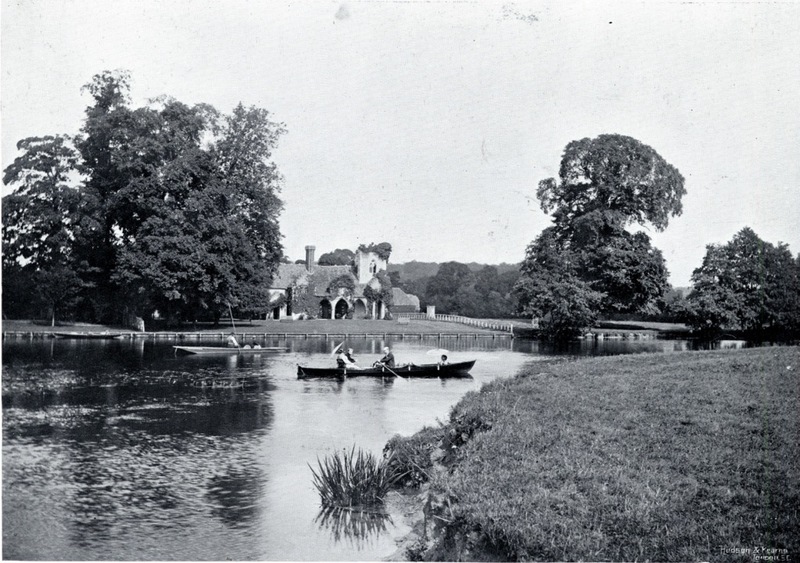 Another bit of local colour below at Medmenham – the building in the centre is Medmenham Abbey, one of the homes of Sir Francis Dashwood’s Hellfire Club,although it would have been a quiet country residence at the time these two parties were rowing by. I’m presenting these pictures in the order they appear in the book although I’m not sure how accurate that is. 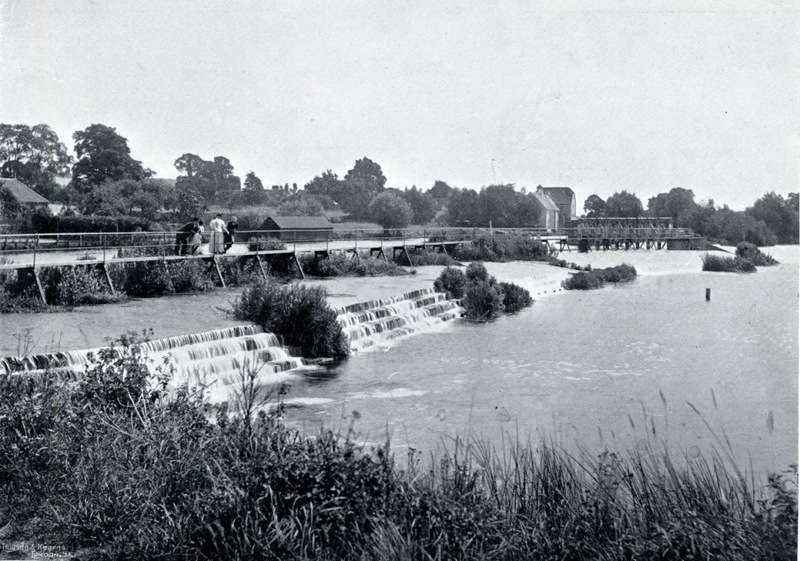 The further up the river the amateur boatsman travelled the more the water landscape was dominate by features like locks and the weir below at Hambleden. 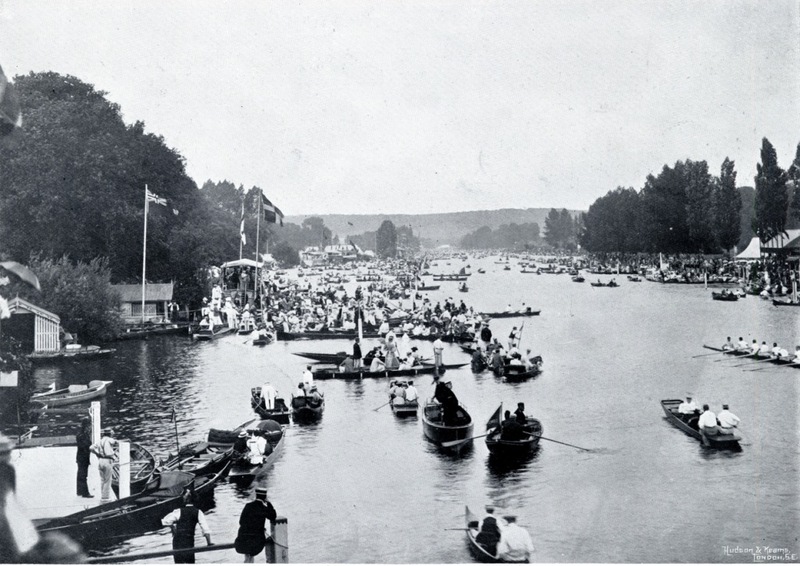 At Henley, where the amateurs met the athletes at the Regatta. 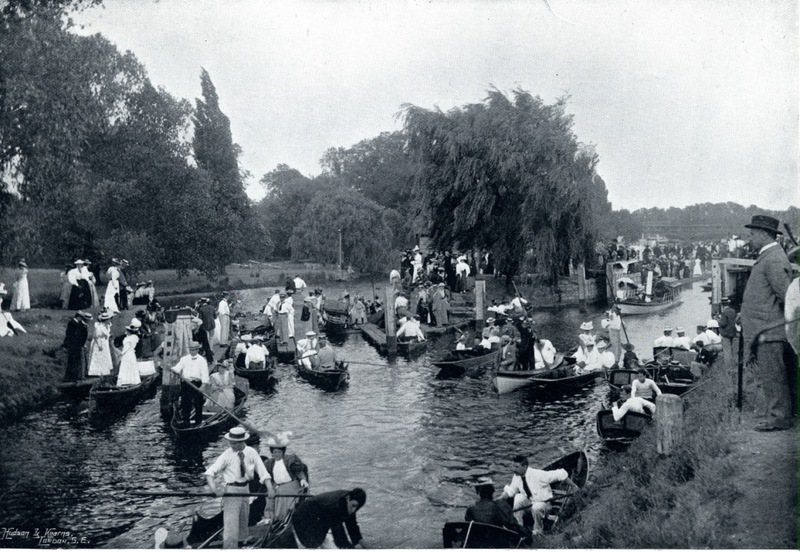 The regatta attracted large numbers of visitors by land and water. Some of them came in those huge houseboats like the ones below. 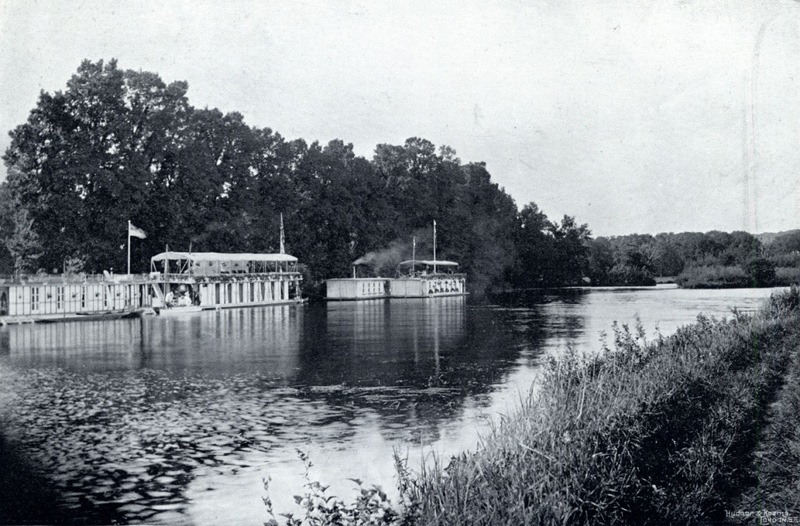 Near Shiplake Ferry, a couple of the giant vessels which were like floating hotels. Just off the river a tranquil backwater. Jerome’s narrator complains extravagantly about landowners who prevented the traveller from entering them with chains across the entrance. Look back at the old post. It’s the final picture. Can you make out that barn? 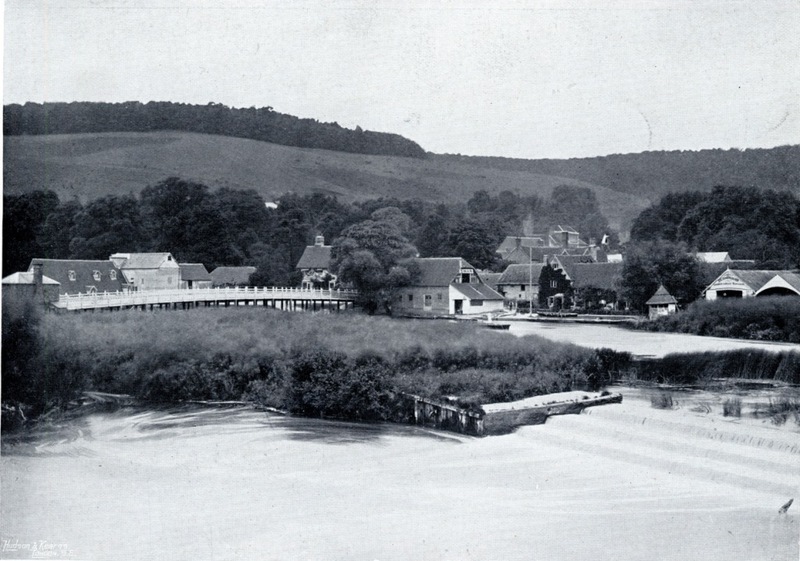 This view of Streatley from Goring Weir has taken us into the heart of that old England of villages, mills and inns. 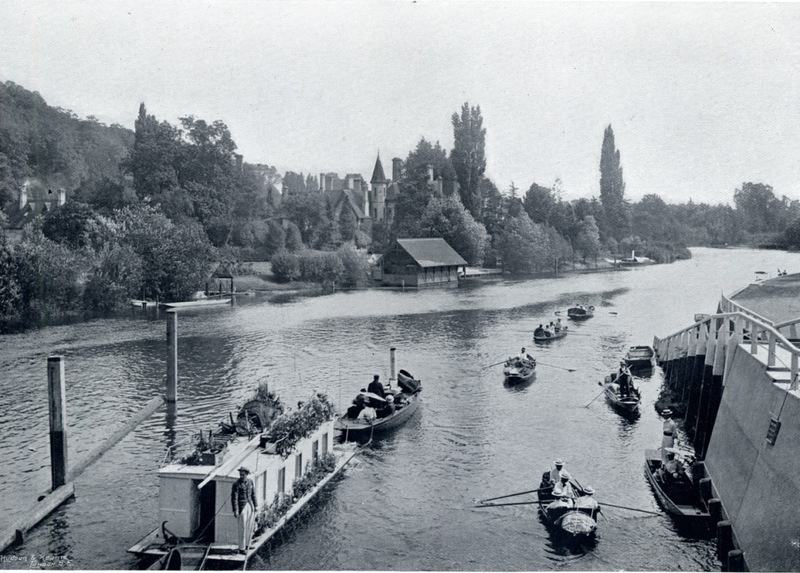 At the end of their journey Jerome’s three friends abandon the boat at Pangbourne and take the train back to town. They finish up at a restaurant in the West End. They’ve done their time on the River and London has called them home. We’ll give the last scene to Menpes, a picture I didn’t use last time but easily could have done. 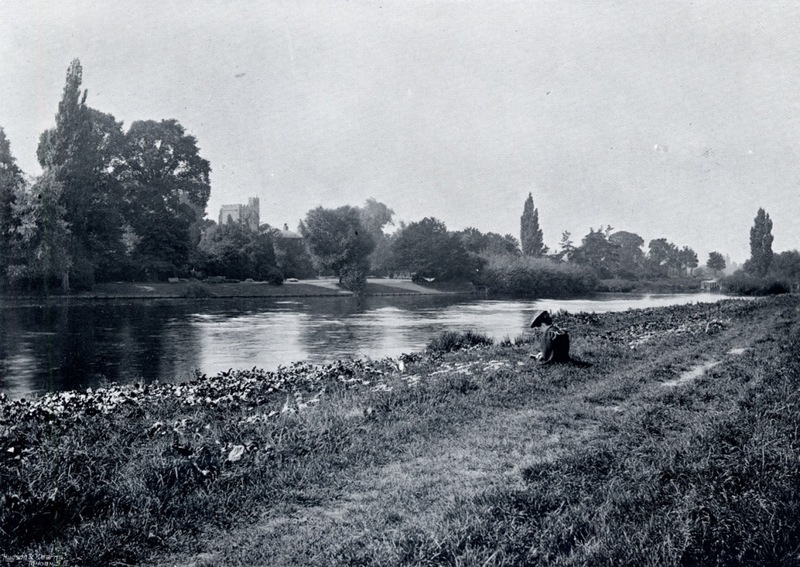 The photographs come from a book called the Thames Illustrated: a picturesque journeying from Richmond to Oxford by Frederick Leyland, published in 1897. I found the text a little dull but there are dozens of excellent pictures in it all showing the slow summer river and the sights beside it. Mortimer Menpes was there a little later in 1906 when the Victorian summer had become an Edwardian summer but not much had changed on the river. There is even one winter picture,of the Thames at Oxford frozen with a crowd of people walking on it. My mother took me to a frozen river once and we walked on it. I was seven or eight at the time but I never forgot it. However, this is the summer. We can leave all ideas of freezing aside for now. 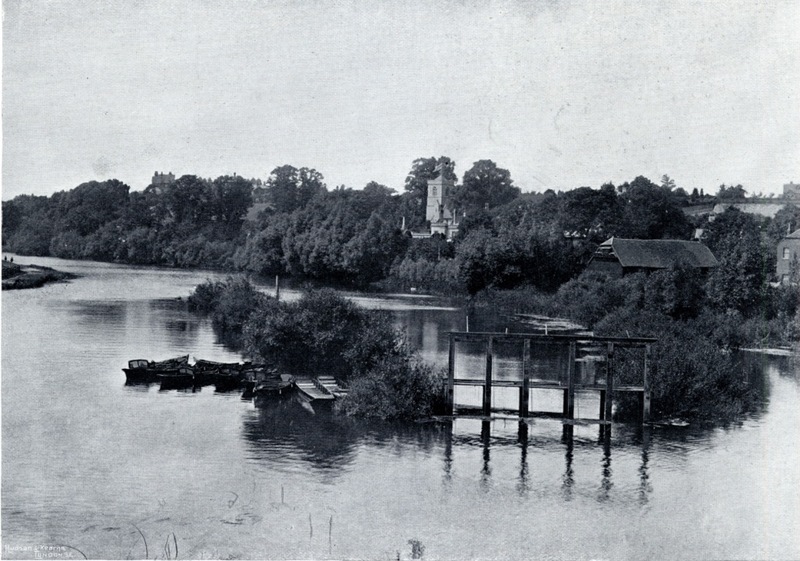 This entry was posted on Thursday, June 19th, 2014 at 12:19 am	and tagged with Bisham, Boulter's Lock, Bray, Caversham, Chelsea, Hambleden, Henley Regatta, Medmenham, Molesey, Mortimer Menpes, Photographs, River Thames, Shiplake, Streatley, Teddington and posted in 19th Century, Chelsea. You can follow any responses to this entry through the RSS 2.0 feed. Such a beautiful and relaxing post. These are wonderful. Strange to think that much of it was under water six months ago and being savaged by reporters from the BBC. MM would encourage his artist friends to do drawings for his daughter Dorothy and they came on sale thirty years or so ago. Nothing by Whistler, but I bought one by George Clausen and a tiny but menacing Highland landscape by D Y Cameron. Thanks again for more wonderful photos. Are the trees still there near Spring Cottage. They look wonderful! I compared this picture with a more recent one I found on Wikipedia and the scene looks very similar. You can still rent out the cottage from the Natioanl Trust : http://www.clivedenhouse.co.uk/spring-cottage/ . Looks good, if a little out of my price range. I wish, Dave! I wish, lol. Dear Dave, little wonder I am smitten by your revelations,.This Worlds End,Slaidburn Street lad stayed with the Allsop family at Goulds Grove,Beggerbush Hill,Ewelme,Oxen, Jerome Klapka Jerome’s previous home.Now called Troy.This was 1943 and I944.J K J is buried in the lovely church at Ewelme which is next door to the school that I then attended a mile and a half walk from home at age six.Troy is I’m told on the market through Savilles. Ahh ,Sunday afternoon picnic at Boulters Lock in the Lady Lever,one of my all time favourites.